How Do I Get Grass to Grow Where Weeds Are Taking Over? Getting rid of weeds and encouraging grass to grow is a challenge for many homeowners. Weeds often thrive in areas where grasses have trouble taking root. Fortunately, it is possible to get grass to grow and get rid of weeds, but it is a multiple step process that requires dealing with the weeds as well as encouraging grass to grow. If you just get rid of the weeds, more weeds are likely to move into the area before the grass is established. If you just work on encouraging grass to grow, the already established weeds will prevent the grass from taking root. Use a spade to remove the weeds, including the roots. Some weeds spread by seeds, but others spread by runners. It is important to remove the entire plant, to prevent it from leaving any runners or seeds behind that allow the weeds to begin growing again. Be aggressive: Don’t be afraid to remove some of your established grass in order to create a boundary between the grass and the area affected by weeds. Work the soil gently in the area where you removed the weeds. Loosen the soil with a rake and mix in a little organic matter. This will improve the quality of the soil and make it easier for the grass seed to get established. Plant grass seed in the prepared area. Choose a variety that blends in well with your existing lawn and is suited for your location. Planting a sun-loving variety in a shady spot, for example, will result in poor germination rates and grass that is not hardy. Grass that is ill-suited for the location will have trouble competing with more opportunistic weeds. Cover grass seed with a thin layer of organic compost or straw. Covering the seeds enhances germination by helping the soil maintain heat and moisture. 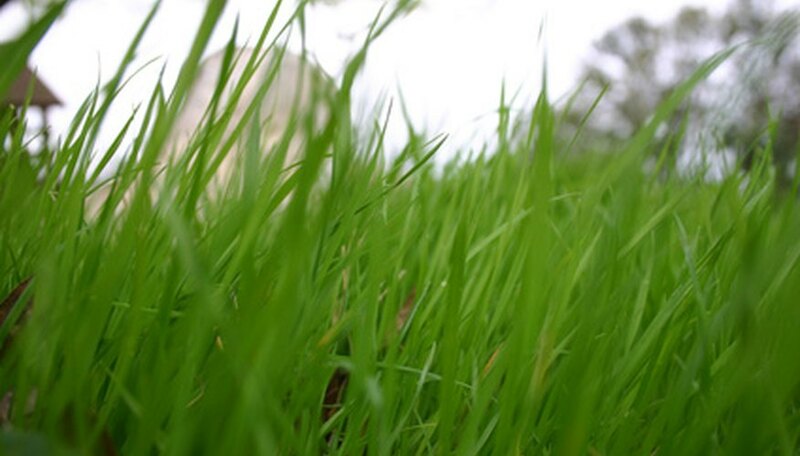 Organic mulch also provides additional nutrients that will help the grass seeds flourish. Watch the area while waiting for the grass to germinate. It is important that the grass seeds germinate and grow free of competition. Weeds can invade the area where you have planted the grass seed and become established before the grass seed has a chance to germinate. Pull weeds by hand, just as you would in a garden. This will prevent the weeds from establishing themselves in your lawn.